Our serious trade disputes, especially China’s failure to enforce international standards for the protection of intellectual property and copyrights, as well as its manipulation of its currency, call for a firm response from a new Republican Administration. . . Some governments have used a variety of unfair means to limit American access to their markets while stealing our designs, patents, brands, know-how, and technology—the “intellectual property” that drives innovation. The chief offender is China . . 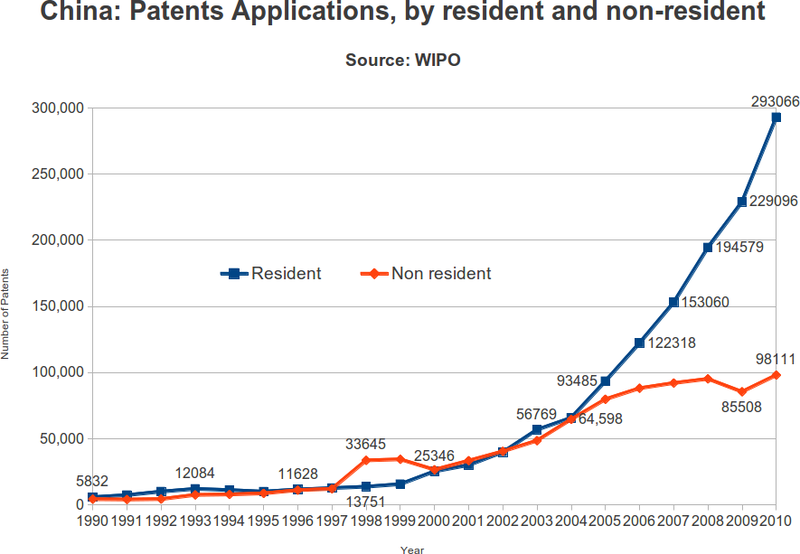 The US does not grant more patents than anywhere else. China does. By a country mile. In 2010, SIPO made over 800,000 grants, the USPTO made 219,614 grants. Of course, around 85% of those Chinese awards were for unexamined design and utility patents. . . In any case, as the Chinese economy grows and SIPO hires more examiners, soon enough it will supersede the USPTO in examined grants as well. China’s central patent office has quickly become the busiest in the world. Last year, for the first time, there were more domestic patent applications filed in China than in any other country, including Japan and the United States. The looming challenge for the U.S. will not be Chinese firms infringing U.S. patents, but U.S. firms infringing Chinese and other foreign owned patents. Analysts say foreign firms can expect to see many more lawsuits coming from China, turning the country into a new front in the global patent wars. Looking forward, the rhetoric about the need for stronger and stronger enforcement of patent rights, including hefty damages and injunctions will seem outdated and under-analysed, on a topic that really matters. * In 2011, the USPTO reported 255,832 foreign patent applications and 247,750 domestic applications.